Our Premium 25-Person Medical Trauma Kit comes packed in a 5-pocket duffle bag. This kit includes the essential supplies needed to perform first aid and triage in a major disaster or medical emergency. 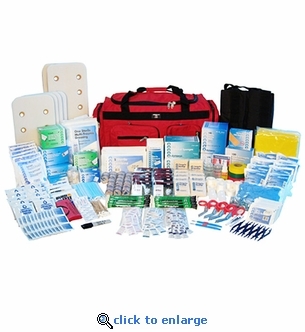 This medical supply kit exceeds ANSI Standard Z308.1.2009 for workplace minimum first aid supplies. This comprehensive 498-piece trauma kit was developed with the help and validation of nurses, EMT's and firefighters. Packaged in a 22" heavy-duty red duffle bag with 5 pockets. The picture shown is of our 100-Person Premium Trauma Kit. The 25-person kit contains the contents listed below. 3 Blood stopping Compression Bandage 9" x 5 ½"
200 Gauze Pads 4" x 4"
3 Elastic Bandage 3" x 5 yds. 1 Disposable Sterile Bulb Syringe 2 oz.